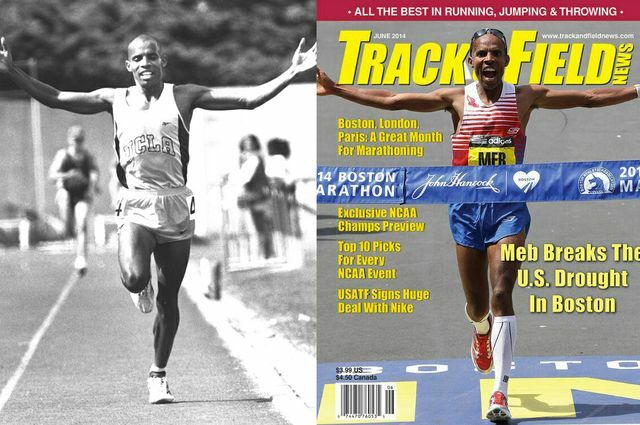 Meb Keflezighi, who graduated in 1999, during his days at UCLA and on the cover of Track & Field Magazine in June 2014 after winning the Boston Marathon. 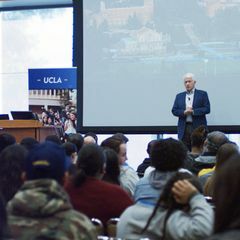 With Los Angeles making a strong bid to host the 2024 Olympic Games — and UCLA set to host the Olympic Village — one Bruin is turning his focus ever stronger toward this summer’s Olympics in Brazil. At 40, he remains UCLA’s most accomplished distance runner. Keflezighi won the silver medal at the 2004 Athens Olympics, becoming the first American male to win an Olympic medal in the marathon since Frank Shorter took silver in 1976. After he sustained a pelvic stress fracture during the 2008 Olympic Marathon Trials, Keflezighi came back to win the New York City Marathon in 2009. 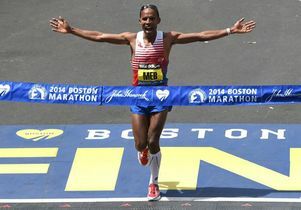 One year after the finish-line bombings at the Boston Marathon, he became the first American man to win Boston in 31 years when he broke the tape “for one of the most poignant victories in the history of sports,” in the words of the marathon trials organizers. In this month’s Olympic marathon trials, the top three men’s and women’s finishers will win places on the team for the upcoming Summer Games in Rio de Janeiro. 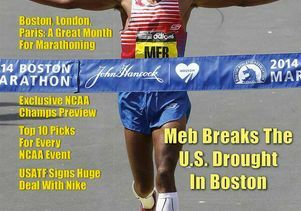 Should he place, this will be Keflezighi’s fourth nomination to the Olympic team. For more information on the course, see the official U.S. Olympic Team Trials page.